Casper, Wyoming (USA) -- When most of us in North America think about Buddhist monks, we are likely to conjure an image of ochre-robed contemplatives engaged in quiet meditation. But, in fact, there has been a debate within the Buddhist sangha (monastic community) over the past two millennia regarding the question of how the Buddhist monastic vocation might best be realized. This debate has been especially apparent in the Theravada tradition that has been dominant in Sri Lanka and Southeast Asia. On the one hand, vipassanadhura monks epitomize the Buddhist monastic ideal as a quest for enlightenment or nirvana through the reclusive practice of meditation, usually within remote forest hermitages. These are the monks who seem to have most captured the Western imagination. On the other hand, granthadhura monks, inspired by the Buddha's summons to "wander for the welfare of the many" to assuage the existential condition of dukkha ("unsatisfactoriness," "suffering") in this world of samsara, are far more likely to be encountered within the context of South and Southeast Asian Buddhist societies. These monks, involved as they are in a variety of social issues and activities within their communities, are the public face of Buddhism. 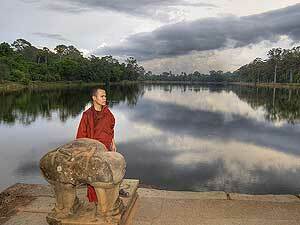 Monks of both persuasions continue to be supported by the Buddhist laity, as they have been throughout history. And there are cogent scriptural warrants for each found within Buddhist sutras. But the latter model has gained increasing prominence in the 20th century, as various members of the sangha have aligned themselves with political movements throughout South and Southeast Asia. One of the arresting images I still remember vividly from the Vietnam War was the self-immolation of a protesting Buddhist monk in the streets of Saigon. This fall, Burmese Theravada monks dared to express publicly their profound disapproval with the manner in which Myanmar's military junta has been the source of great dukkha for the people of Burma. While the images of violence that reached us in the West were very disturbing, the actual violence that occurred in Yangon (Rangoon) and in other cities across the country, especially violence against monks, was even more disturbing to most Burmese. While monks are symbols of the Buddha's dhamma (teaching, truth, law), they are also regarded as embodiments of what is valued most in Theravada societies. In times of great social, economic and political change, monks are often seen as the defenders of the country's indigenous moral and cultural traditions. This is certainly why some Sinhalese voters recently elected nine Buddhist monks to parliament in Sri Lanka. It is also why, during the Second Indo-China War, Pathet Lao leaders in Laos sought to infiltrate the sangha to convince its respected monks of its cause in fighting the Americans. Indeed, enlisting the support of the sangha has become essential for all aspiring political players in this region of the world. Before colonialism, the sangha legitimated Buddhist kingship in these countries, as it does still in Thailand today. Contemporary politicos always seek, in one way or another, to gain a similar legitimacy by winning support from members of the sangha. By attacking peacefully demonstrating members of the sangha violently in public, the Burmese political junta has crossed a threshold that has evaporated any modicum of legitimacy it may have previously enjoyed. Were Burma democratic, then the military junta would have committed political suicide by its dastardly acts. Aside from the military, the sangha is the only other nationwide institution in Burma. While it is unlikely that the sangha will join with armed resistance groups representing other ethnic minorities in Burma, it is now clear from these recent events that the Burmese junta is isolated from the rest of Burmese society. It can only hold on to power by means of naked aggression against its own people, and against the moral and cultural values that the sangha embodies. By its actions, the junta has declared that it is now at war with Burmese culture itself. John C. Holt is the William R. Kenan Jr. Professor of the Humanities in Religion and Asian Studies at Bowdoin College. This is a writing he contributed to "Sightings," a publication from the Martin Marty Center at the University of Chicago Divinity School. Past Religion Today columns and more information about the program can be found on the Web at www.uwyo.edu/relstds.